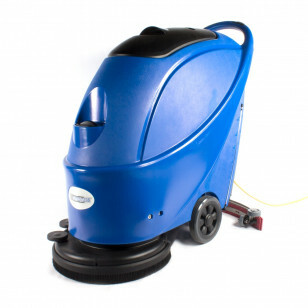 This Trusted Clean 'Dura 17' is a simple, rugged, affordable electric auto scrubber designed with the user in mind, with easy to use controls, a small machine footprint to allow for quick maneuvering in tight areas such as hallways and in between storage racks and comes equipped with a 65' safety yellow cord for usage in areas with limited outlets. The 'Dura 17' is engineered to withstand daily commercial usage in schools, office buildings and medical facilities. For additional savings, we've included the pad driver and squeegee assembly. Make sure you select the proper 17" floor pads and floor cleaner that meet your floor cleaning needs. Or, for a package that contains everything you'll need to clean a wide variety of floors, please check out our Dura 17 auto scrubber bundle. Also be sure to check out our 17" nylon brush designed specifically for this auto scrubber, that can assist you with your grouted tile or uneven floor cleaning projects. If outlet location or accessibility is a concern, check out our battery powered auto scrubbers which provide extended run times and the versatility to go cordless. 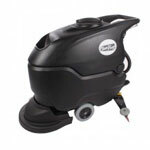 We suggest the CleanFreak® 20 inch auto scrubber for unsurpassed value! Pad assist driver - allows you to easily maneuver the auto scrubber as you clean. Single pad driver or optional brush with 17" scrubbing path. Rear squeegee recovers the solution as you scrub, leaving your floors dry to the touch after passing over it. 77 pounds of brush pressure at 160 RPM. Comes with a 8 year warranty on the body, 5 years on parts, 1 year on the vac motor & 180 days for travel.